My palate has been craving for local desserts for some time now. I still love my macarons, cakes and what not. 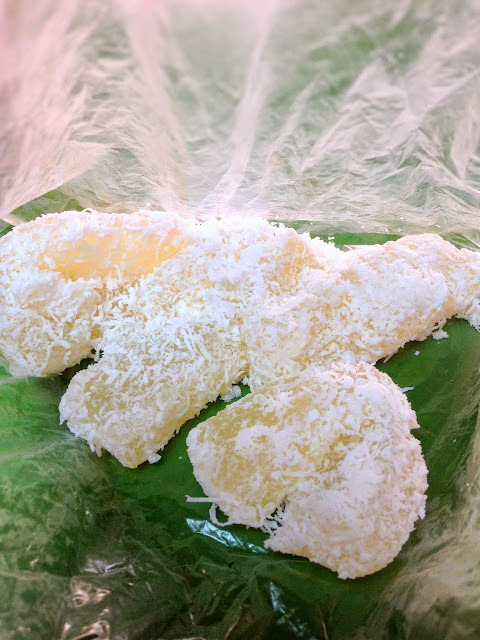 But tell me that there is some good kueh to be sussed out at the other end of the island? I’ll be thinking about it night and day till I get my hands on them!! 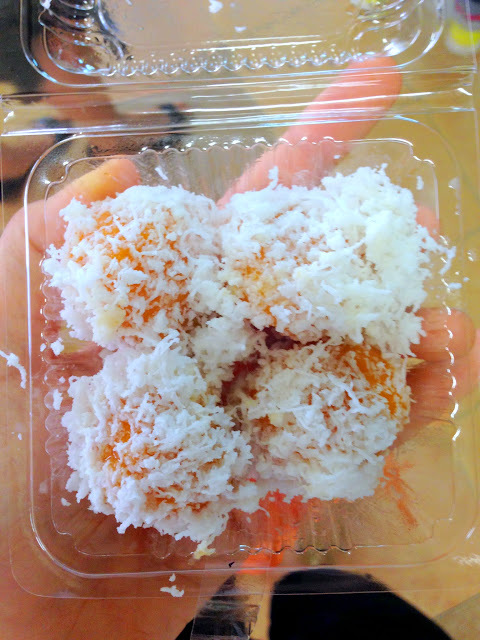 These were just out of the boiling vat of water at the stall, rolled in juicy dessicated coconut, and thrown quickly into a box. Let me assure you that the whole process of making-cooking-buying-going into my stomach didn’t take very long. It shouldn’t anyway because Ah Meng’s ondeh are IMO, best savoured hot. 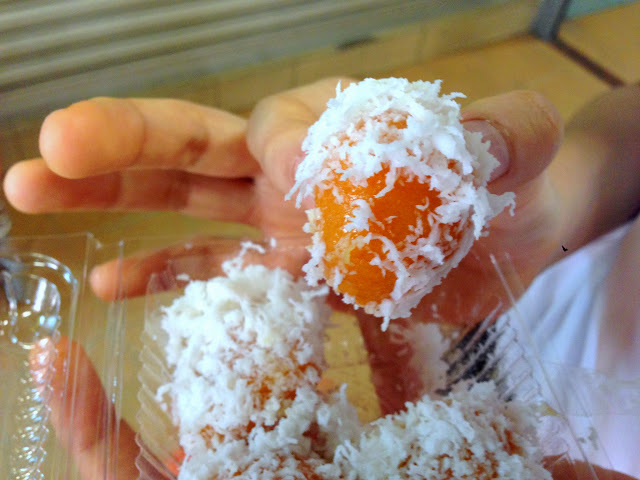 The bright orange hued skin was squishy-soft and tender, full of savoury- sweet sweet potato flavour (most places use pandan now but I LOVE a good sweet potato ondeh ondeh), and right at the centre was a gritty gula melaka core. Unfortunately, they chose not to melt the gula melaka all the way through. Sorry folks, there was no explosive action here. 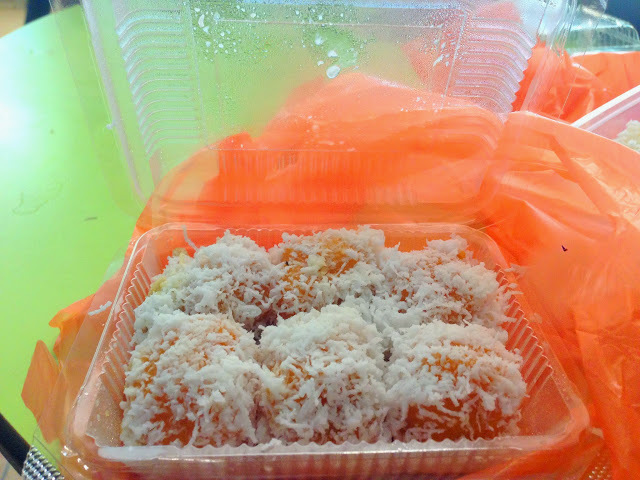 At least for me, it was good enough to warrant a second (bigger) box – because dad needed to have his share too hehe. I think the old uncle was a bit taken aback by my sudden, awkward, broken- chinese rave. The steamed tapioca kueh was outstanding too- soft, tender (I’m so tired of using this word but it’s the best word I can think of that differentiates GREAT kueh from substandard ones), with the light sweetness of tapioca coming through. This is comparable to the one from Xing Xing (below). 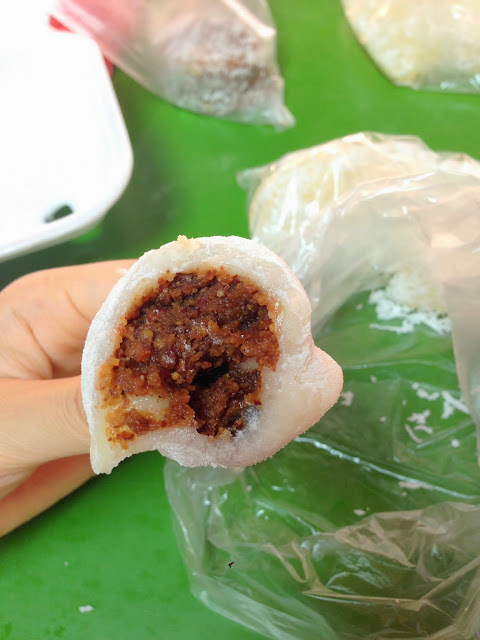 Their steamed tapioca is wildly popular because of it’s pillowy soft texture. 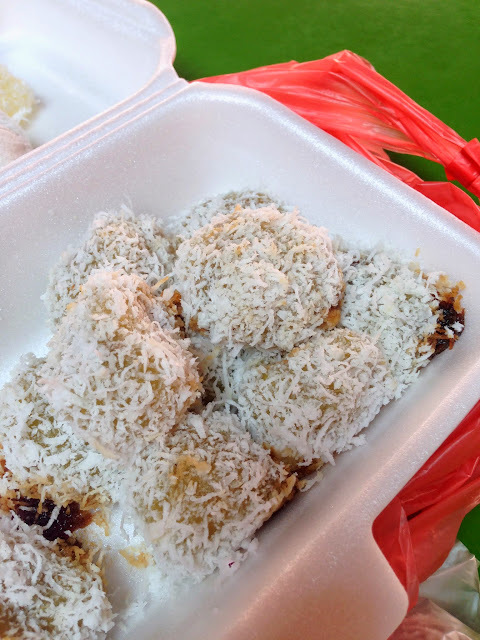 As I’ve said before, I prefer Nonya Delicatessen’s (Bukit Timah Plaza) version which is much tastier, and richer possibly because they are more heavy-handed with the coconut milk. For some, Xing Xing’s version might be less gelat because of its light, clear sweetness. We came here for their ondeh ondeh and we were not disappointed. There was definitely explosive action going on here but for some of them, the gula did not melt all the way through. I appreciated the softness of the skin, but I think Ah Meng’s sweet potato skin was tastier. 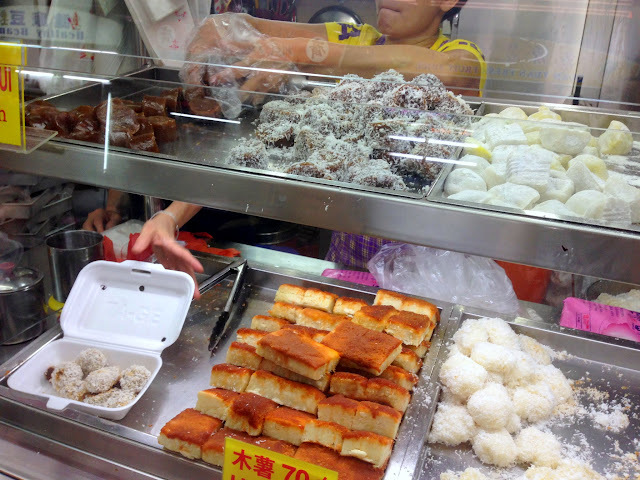 My top two favourite things from this stall is their kueh kosui, and peanut lor mai qi. As always, their kueh kosui was fantastic both in terms of texture and flavour. 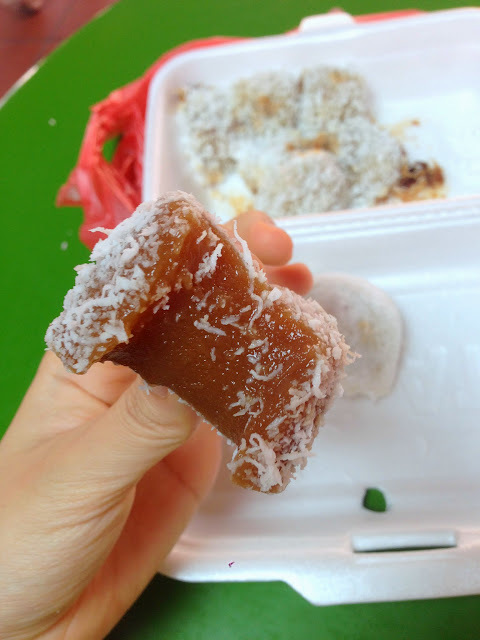 Most kueh kosuis are horribly jelly-like but theirs was the total opposite. Flavour-wise, I loved how the caramelly gula melaka was mellowed by the coconut milk. The Peanut Lor Mai Qi boasted a very savoury, sweetened roasted peanut and sesame filling, but what stood out was the mochi-like skin. It’s so soft that you’ll never want to eat those terrible, bouncy machine made mochis ever again. At this price point, it’ll give Japanese mochi a run for their money. So this ends the first instalment of my current kueh craze. Where shall I go next? 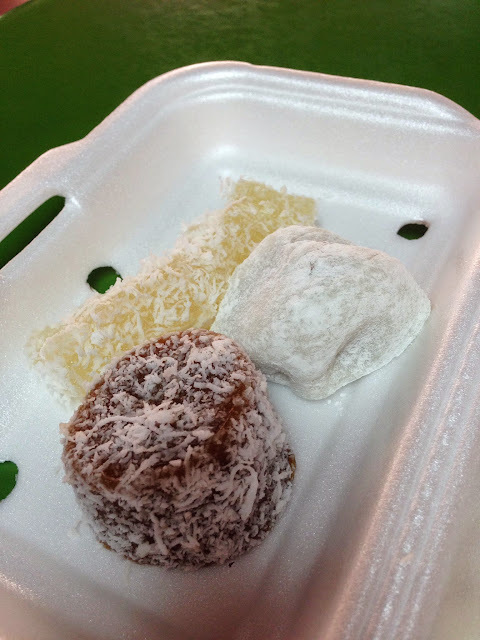 try the onde onde at Cambridge Deli – #01-06, 216G Syed Alwi Road. it’s not bad. I’ve never tried the ones at maxwell cos they’re always closed when i pop by! Try a weekday morning (: They open at 9am but get sold out at about lunch time. 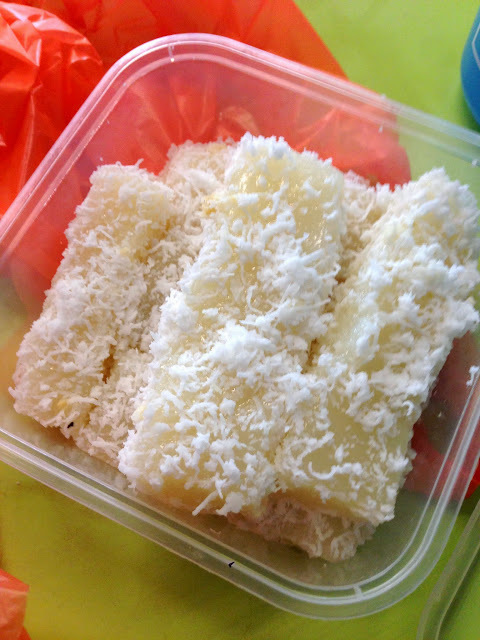 I saw people reserving kueh to collect at lunch! They don’t open on Sundays too.